استفاده نوجوان از اینترنت در سال‌های اخیر، بویژه با هدف گسترش روابط و پیوند‌های اجتماعی به شدت افزایش یافته و روابط آنلاین به بخشی جدانشدنی از فرهنگ و زندگی اجتماعی آنان تبدیل شده است. شناخت ماهیت و ویژگی‌های ساختاری شبکه‌های اجتماعی، بررسی اثرات شبکه‌های اجتماعی بر روابط بین فردی نوجوانان، آشنایی با اثرات شبکه‌های اجتماعی بر تنش‌های خانوادگی و شناخت اثرات شبکه‌های اجتماعی بر مهارت‌های تحصیلی نوجوانان از جمله اهداف مهم این مطالعه بوده است. روش این پژوهش اسنادی و مراجعه به پژوهش‌های مختلف بوده است. یافته‌ها نشان می‌دهد:1. اینترنت، دنیای نوجوانان و روابط آنان را با همسالانشان گسترش داده و راه‌های ارتباطی جدیدی را با افرادی که بیرون از اجتماع نزدیک آنها هستند، فراتر از مکان، سن، جنس، نژاد، قوم، زبان و ... فراهم کرده است؛ 2. ازجمله اثرات فنّاوری اطلاعات و ارتباطات بر خانواده‌های دارای نوجوان، متنوع‌سازی شبکه‌های اجتماعی، به چالش کشیدن سلسله مراتب در خانواده، به چالش کشیدن خودمختاری نوجوانان و شکاف انتظارات است و 3. برای شناخت ویژگی‌های ساختاری شبکه‌های اجتماعی از هشت عامل: اندازه شبکه، شباهت، تعدد منابع، تعدد رسانه‌ها، مرکزیت، تراکم، قدرت پیوند‌ها و عمل متقابل می‌توان استفاده کرد. نتیجه آنکه، تمرکز مطالعات آینده باید به طور همزمان بر ویژگی‌های اجتماعی و رسانه‌ها باشد تا مشخص شود کدام گروه‌های اجتماعی از پیوندهای آنلاین بهره بیشتری می‌برند. 1. Internet has developed teenagers’ world and their relationships with peers and has provided them with new ways of communication with those being out of their near society; 2. Information and Communication Technology has consequences in families with teenagers including diversification of virtual social networks, challenging family hierarchy and teenagers’ independence, and also expectations gap; 3. It is possible to recognize the structural characteristics of virtual social networks by using 8 factors: network size, similarity, resources, media, centrality, density, relationship strength, and interaction. As a result, future studies must simultaneously focus on social characteristics and the media in order to ascertain which social group takes advantage of online relationships more. برگر، کاتلین. ( 1389). روان‌شناسی رشد (ترجمه اسماعیل سعدی‌پور). تهران: دوران. Bargh, J.A. (2002). Can You See the Real Me? Activation and Expression of the True Self' on the Internet. 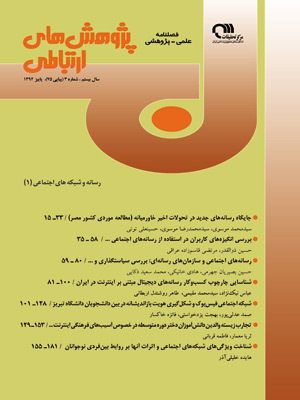 Journal of Social Issues, 58, pp. 33-48. Beraman, P.S. & Moody, J. (2004). Adolescents Suicidability. American journal of public Health, 94, pp. 89-95. Bimber, B. (2000). Measuring the Gender Gap in the Internet. Social Science Quarterly, 81, pp. 868-876. Drori, G. (2006). Global E-Litism: Digital Technology, Social Inequality, and Transnationality. New York: Worth Publishers. http://www.economist.com/sciencetechnology/displaystory.cfm?story id =13176775 (accessed 26 June 2009). Hill, R.A. & Dunbar, R.I.M. (2003). Social Network Size in Humans. Human Nature,Vol. 14, No.1, pp. 53-72. Hine, C. (2005) . Internet Research and the Sociology of Cyber Social Scientific Knowledge. The Information Society, Vol. 21, pp. 239-248. Larson, R.W. & Verma, S. (1999). How Children and Adolescents Spend Time Across the World: Work, Play, and Developmental Opportunities. Psychological Bulletin, 125, pp. 701-736. Livingstone, S. & Bovill, M. (2001). Children and Their Changing Media Enviroment: A European Comparative Study. Hove, UK: Lawrence Erlbaum Associates Ltd.
Livingstone, S. & Helsper, E. (2007). Taking Risks When Communicating on the Internet. Information, Communication and Society,Vol. 5, pp. 619-644. Marsden, P.V. & Campbell, K.E. (1984). Measuring Tie Strength. Social Forces, 63, pp. 482-501. Mesch, G.S. & Talmud, I. (2007). Similarity and the Quality of Online and Offline Social Relationships Among Adolescents in Israel. Journal of Research in Adolescence, Vol.17, No.2, pp.455-465. Neal, J.W. (2007). Why Social Networks Matter: A Structural Approach to the Study of Relational Aggression in Middle Childhood and Adolescence. Child and Youth Care Forum, 36, pp. 195-211. Pfeil, U.; Arjan, R. & Panayiotis, Z. (2009). Differences in Online Social Networking - A Study of Users Profiles and the Social Capital Divide Among Teenagers and Older Users in Myspace. Computers in Human Behavior, 25, pp. 643-654. Prensky, M. (2001). Digital natives, digital immigants. On the Horizen, Vol. 9, pp. 1-6. Sassen, S. (2002). Toward a Sociology of Information Technology. Current Sociology, 50, pp. 365-388. Subrahmanyam, K. & Greenfield, P. (2008). Online Communication and Adolescent Relationships. The Future of Children, Vol. 18, No. 1, pp. 119-146. Turkle, S. (1996). Parallel Lives: Working on Identity in Virtual Spaces. In D.Grodin and T.R. Lindlof Constructing the Self in a Mediated World: Inquiries in Social Construction. Thousand Oaks, CA: Sage. Van Dijk, J. (2005). The Deepening Divide: Inequality in the Information Society. London: Sage. Wellman, B. & Gulia, M. (2001). Computer networks as social networks. Science, 293, 2031-2034. Wellman, B.; Salaff, J.; Dimitrova, D.; Garton, L.; Gulia, M. & Haythornthwaite, C. (1996). Computer Networks as Social Networks. Annual Reviwe of Sociology, 22, pp. 213-238. Wolak, J.; Mitchell, K.J. & Finkelhor, D. (2003). Escaping or Connecting? Characteristics of Youth Who Form Close Online Relationships. Journal of Adolescence, 26, pp. 105-119. Youniss, J. & Smollar, J. (1996). Adolescents Interpersonal Relationships in Social Context. In T. Berndt and G.W. Ladd Peer Relationships in Child Development. New York: Wiley.